Well, you know what they say about the best laid plans of mice and men, etc - etc. My latest project didn't exactly turn out like I thought it would. 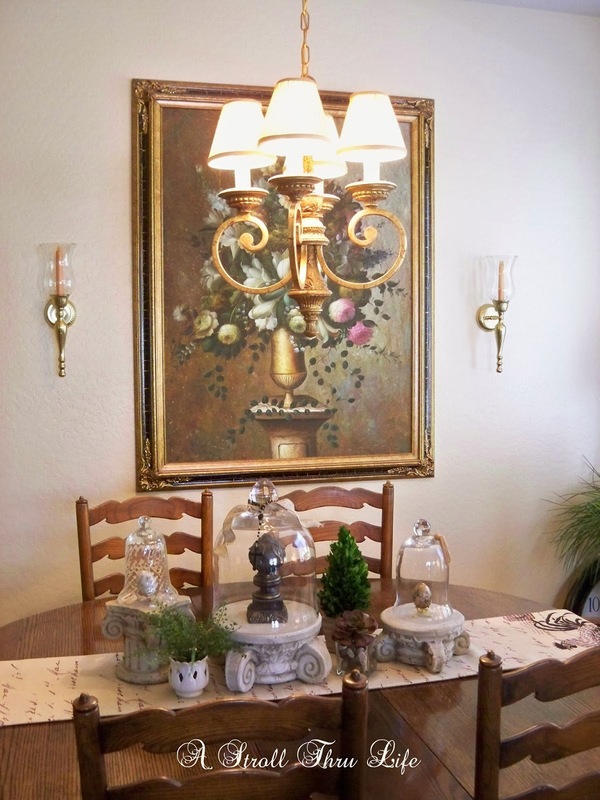 When I did my last post showing how I swapped out corbels and plates for the sconces in the dining area, I suggested that adding a little bling to the chandy might be nice and you all agreed. I found some magnet prisms online, ordered them and couldn't wait to change things up. Since my chandy didn't come with any bling, the magnets were supposed to be the perfect answer, unless what you have isn't all metal. See all that scrolled part in the middle and the candle cups, none of that is apparently metal, just the 4 scroll arms. Now how weird is that. I have no idea, but some kind of molded something, but certainly not metal, a magnet will not stick to it. So now since I have all these pretty baubles, this is the only way I could figure out to hang them. Not what I thought I was going to do. I was originally going to put 2 on the side of each each candle cup and then one hanging down from the center arm scroll. If that looked good then I would see about adding more. Well, since that idea fell flat, instead I have 3 hanging down from the center arm. Love the prisms, they are gorgeous, just not sure about this. I changed out the vignette to something a little more "refined" too. As you can see I made another faux tree topiary. You can see my tutorial here. I think I still have to think about this one for a while. I guess I could drill some holes, but since I am not sure what I am dealing with, not so sure about that. So give me your opinion. Keep, get rid of, change up or what? Don't forget, you can still link up to Inspire Me, party is still ongoing. 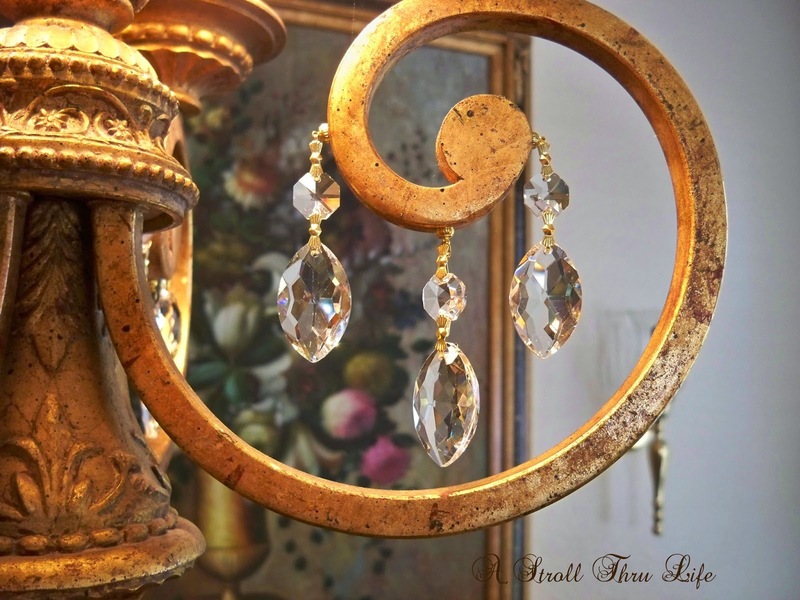 Marty, I love the bling for your chandelier! What a fabulous idea to add magnetic crystals! 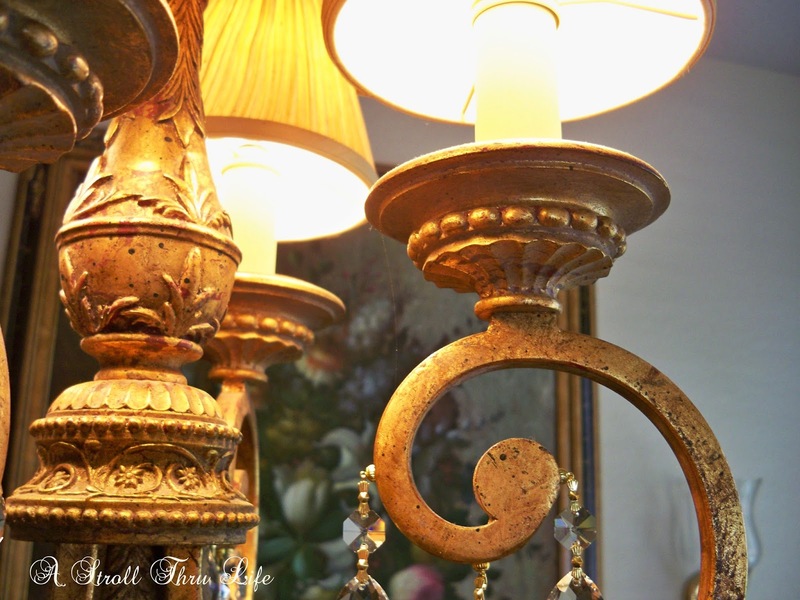 Your vignette is lovely and a perfect blend for your new chandy bling! It looks beautiful. Love the vignette it looks perfect. Hi Marty! 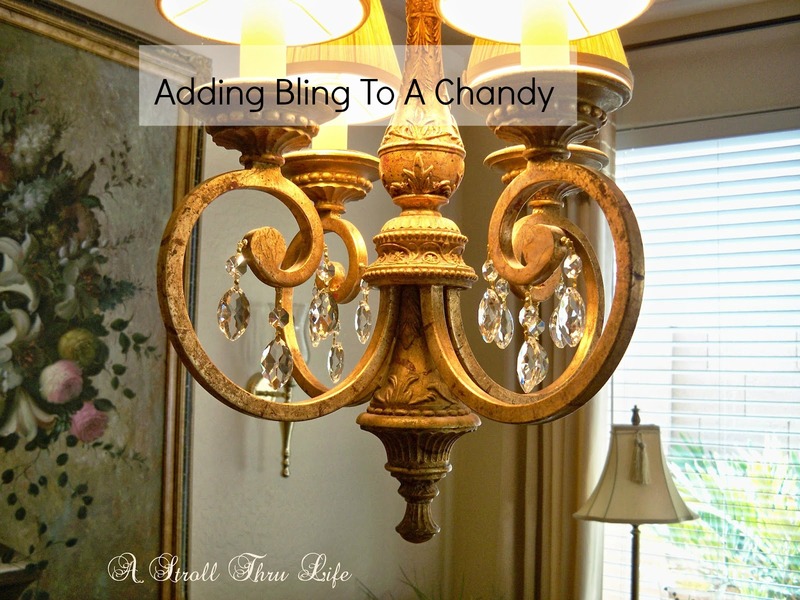 I think the bling looks great on your chandy. Now here's an idea about hanging some bling down from the center thingy - you could add just a drop of hot glue to the bling and then stick it up there. Most of the time hot glue will pull right off if you want to remove it. Thanks so much for popping in to see me. Looks great! I love it. I think it looks pretty, Marty...the light always looks wonderful when it has something to bounce off of. And your centerpiece is beautiful. It made me think that I have a swan somewhere around here! lol! Sorry it didn't turn out like you planned. I bet your chandelier is a type of resin. No, I wouldn't drill into that. It could crack instead. Will the bling stick to the bottom of the candle arm? You could put one there. I like the bling. Even a little is fun. I think it is the perfect amount of bling Marty. VERY pretty and I wouldn't change a thing! Cute little topiary too. I've been working on one for myself tonight. 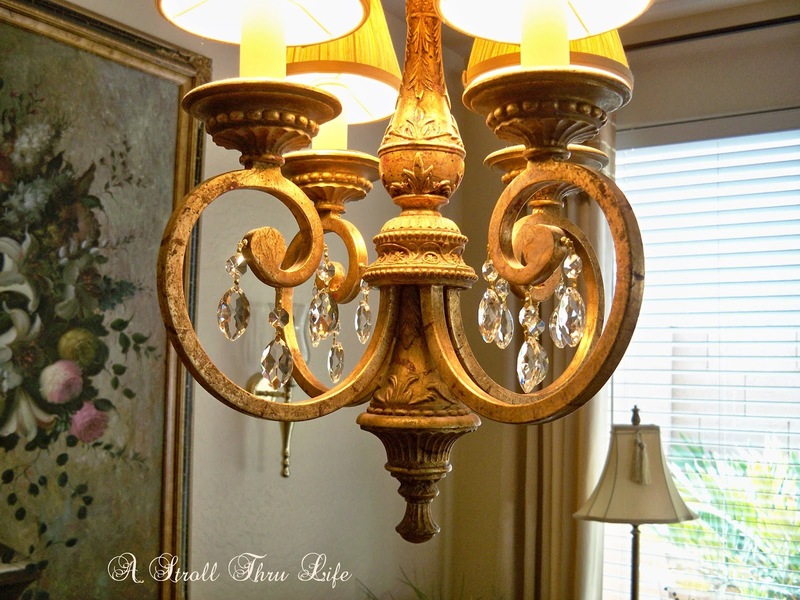 I think the bling looks very lovely on your chandy Marthy. And what about hanging some bling down from the center? I think that will give it a finished look! Darn! Who would have thought that a chandelier would be molded..maybe it's resin? Are you brave enough to use a little hot glue? I definitely want to make one of your topiaries. I like the bling Marty. I think it looks great. Seems like it's just enough! The bling is such a nice added touch I like it! I like it a lot. 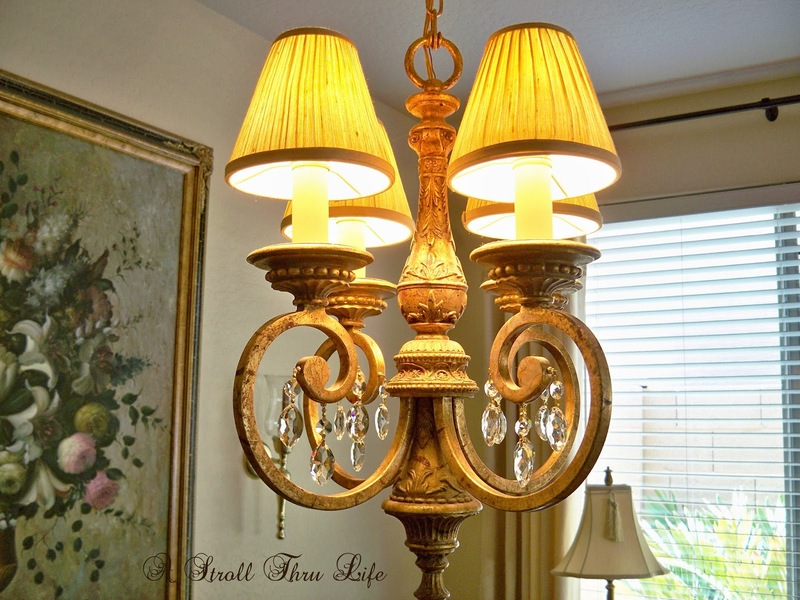 I now want to add some to my chandy to give it a little bling. Could you say where you ordered the crystals? I found the magnet prisms on ebay, however they are all over the internet, just do a search for magnet prisms and there will be tons of places. I didn't know chandy blings come in magnetized form Marty! They look perfect for you lighting! I wouldn't remove it if I were you. 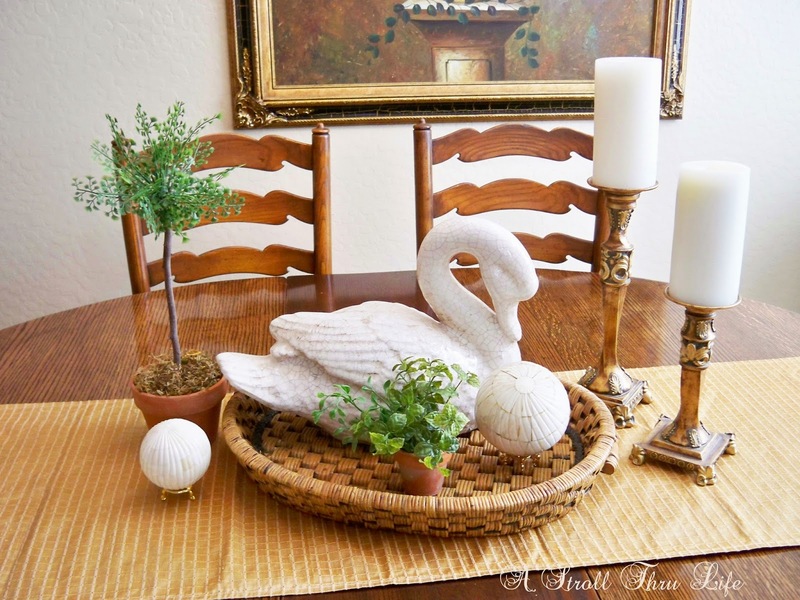 Love the new topiary as well and your simple and elegant vignette dear! Marty, have you ever heard of museum putty???? It is GREAT!!! I bet if you stuck some to the chandy the crystals would stay!!!!! Hope this helps. I use it all the time!!!!! I really like it - it blings it out without taking it over the top. I think it's just right. I'll be curious to see if it grows on you or if you'll feel the need to change it! Could you tie on with very fine clear thread?? Oh you will find a way to execute your idea..if not looks good like that. I saw that your temps were 100 the other day? They look beautiful, Marty.....I say they're keepers! I was thinking about doing something like this to our dining room light fixture. I played around with some extra crystals I had, but just wasn't liking the look. I think I'm going to hold out and just find a chandelier with crystals to replace our existing one at some point. If you are not sure, I would live with it for a couple of days and see how you feel then. I gotta say...I kinda love it! Sometimes less is more. 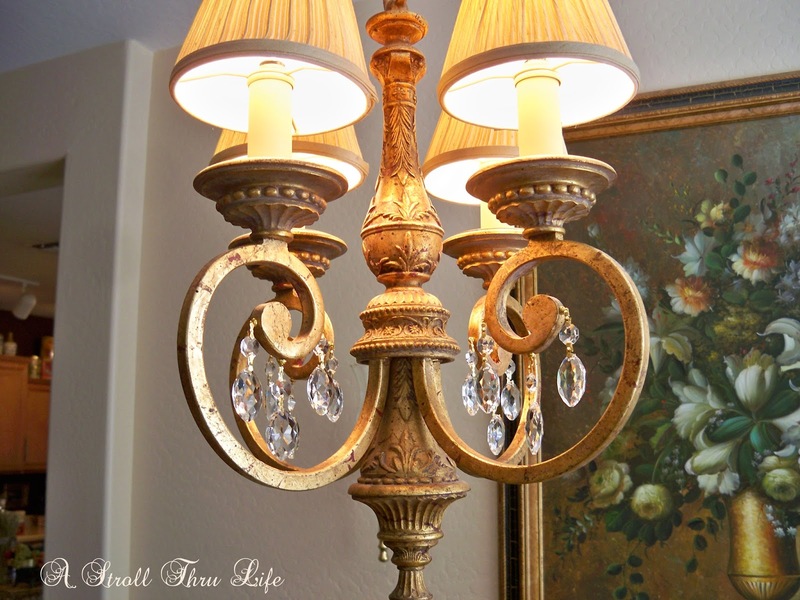 you still have the beauty of your chandy with just a little sparkle! Marty, your 'bling' looks great! I have some lamps next to our bed that are also made out of resin or something. (check my blog master bedroom pictures) I drilled holes through them and added crystals. You can get 'chains' of crystals on save-on-craft.com really inexpensively also. I think it looks wonderful! Marty,I think it looks great! I think I would add one more to the center and try using a dab of hot glue like the others were saying. Thank you for stopping by my blog the other day (thereddoordecor) and your nice comment, and also for your like on Facebook. I left you a reply, but I don't think you got it. Just wanted to say thanks and you are such an inspiration! OK...AZ girl with opinion....do not hot glue. If you ever go away and down the air, you could lose the glue and they would fall, breaking whatever you have on the table. I like what you did but I would either leave it or drill....or new chandy?? Same reason I keep my candles in the refrigerator!! Well Marty....I am all about a little bling! I think your addition looks lovely! You are so creative and inspire me always to change and update my décor. Your home is so very beautiful! I think the bling you added is exactly the right amount! But... :) I'm not sure exactly what look you are after. I like it! I like what you did with the bling! I also love that topiary you did. Think I'll try to make one of those. We all have moments of inspiration and then we think, "Well, that didn't work!" You have some wonderful ideas and I enjoy seeing your vignettes and decorating ideas. I'm sure you will think of something fantastic that will make you think, "That's it!" Always look forward to checking in to your blog and your great adventures! I think they look good, Marty. I didn't know they made magnet ones. Marty I LOVE the added bling!! What a nice touch...really pumped up your look...like a great pair of shoes does for an outfit! Thanks for sharing on the Thursday Blog hop! Very clever way of hanging the bling Marty. I think it looks great the way you've hung them and adds so much to the chandy! I agree that you have the perfect amount of bling! I wouldn't change a thing!! Lovin' the sparkle Marty! Fabulous! I think it looks lovely, Marty! I didn't know about magnetic prisms, but I am going to look into that. 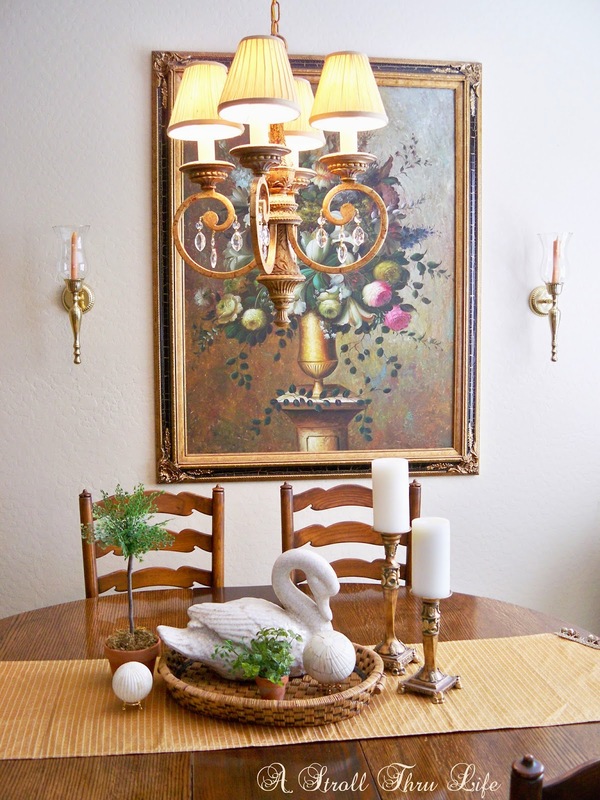 I'm pretty sure my dining room chandy is metal (it was very heavy to hang....lol), but I will definitely check that out before I make a purchase. Could you possibly use a dot of hot glue just to get the placement and then use E6000 for the permanent fix? I agree with Ceekay that the hot glue might not hold permanently in our climate. It turned out really pretty! Great job! Can a girl really have too much sparkle? I don't think so!